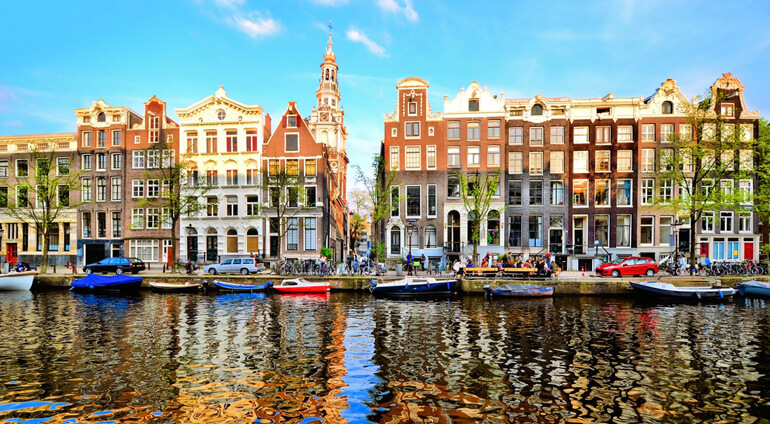 Browse our low-priced flights to Amsterdam from Globehunters. One of Europe's most popular tourist destination, this famous city attracts people from across the globe. And with so many other Europeans cities in close proximity, there are plenty of opportunities for further travel from here. Schiphol Amsterdam International Airport is a long haul flight from Australia. But once you get there, the onward journey into the city is easy by taxi, bus or train - all of which operate frequently. Once in Amsterdam, there are trams and buses for you to get around in but you will quickly notice just how cycle friendly this city is. Bicycles really do rule the road so it might be worth exploring the city on two wheels.